Datasets published on the Web are accessed and experienced by consumers in a variety of ways, but little information about these experiences is typically conveyed. Dataset publishers many times lack feedback from consumers about how datasets are used. Consumers lack an effective way to discuss experiences with fellow collaborators and explore referencing material citing the dataset. 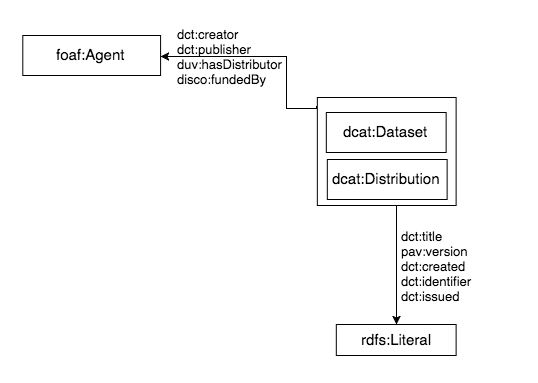 Datasets as defined by DCAT are a collection of data, published or curated by a single agent, and available for access or download in one or more formats. The Dataset Usage Vocabulary (DUV) is used to describe consumer experiences, citations, and feedback about the dataset from the human perspective. By specifying a number of foundational concepts used to collect dataset consumer feedback, experiences, and cite references associated with a dataset, APIs can be written to support collaboration across the Web by structurally publishing consumer opinions and experiences, and provide a means for dataset consumers and producers advertise and search for published open dataset usage. This document presents the most mature version of the Dataset Usage Vocabulary that could be produced in the lifespan of the Data on the Web Best Practices Working Group. At the time of publication, it has remained stable for several months, even after receiving feedback and suggestions from the community. Further clarifications and extensions of this model may be carried out by future working groups. This document was published by the Data on the Web Working Group as a Working Group Note. If you wish to make comments regarding this document, please send them to public-dwbp-wg@w3.org (subscribe, archives). All comments are welcome. The Data on the Web Best Practices working group identified Best Practices [ DWBP ] for citing published data, conveying feedback between consumers and publishers, and providing descriptive metadata that provides insights to the consumer about how published datasets can be used. The dataset usage vocabulary is viewed as an extension to the Data Catalog (DCAT) vocabulary version 1.0 [ VOCAB-DCAT ] to fill current existing gaps required to adequately cite, describe usage, and convey feedback on published datasets and distributions. Broadly speaking the vocabulary is domain-independent and open. As an open vocabulary the DUV encourages publishers to add descriptive metadata tailored to meet each publisher’s domain-specific needs. When publishers and consumers exchange, combine, and reuse published data, the DUV metadata allows usage information to be clearly identified and cross-referenced across datasets. Because the DUV heavily relies on vocabulary reuse descriptive metadata in many cases can be leveraged from original vocabulary. The DUV is modular consisting of four sub-models (DCAT, citation, usage, feedback) to support different practitioner needs. As a result the DUV can be used in part (DCAT+citation, DCAT+usage, DCAT+feedback) or in its entirety depending on the practitioner’s requirements. The DCAT+usage submodel is loosely defined to either indicate usage from an informational perspective, or if descriptive metadata is required, the usage submodel can indicate to find this information. Additionally, the citation submodel describing basic electronic citation elements, bibliographic references to dataset, and citation rationale can be independently used. View as: Turtle (press 't') JSON-LD (press 'j') . The namespace for DUV is http://www.w3.org/ns/duv#. It should be noted that DUV makes extensive use of terms from other vocabularies which rely their own sets of namespaces. A full set of namespaces and prefixes used in this document is shown in the table below. The DUV is intended for data producers and publishers interested in tracking, sharing, and persisting consumer dataset usage. It is also intended for collaborators who require an exchange medium to advertise and interactively convey dataset usage. The scope of the DUV is defined by the Data on the Web Best Practices (DWBP) Use Case document [ DWBP-UCR ] based on the data usage requirements about datasets. These requirements include: citing datasets on the Web, tracking the usage of datasets, sharing feedback and rating datasets. These requirements were derived from fourteen real world use cases examples provided in the use case document. Based on DWBP the DUV heavily relies upon is vocabulary reuse to support citation, feedback, and usage of datasets published on the Web. This section provides our rationale and approach for vocabulary selection and reuse. The core DUV begins with reusing the Data Catalog Vocabulary [ VOCAB-DCAT ] dcat:Dataset and dcat:Distribution classes and many of their related properties. In fact, the DUV can be considered an extension of the dcat:Dataset and dcat:Distribution classes. The Web Annotation Vocabulary [ Annotation-Vocab ] is used to describe duv:Feedback as a subclass inheriting the behavior of oa:Annotation. The intent for the duv:Feedback is provided by the oa:motivated_by property and oa:Motivation subclasses (for example: oa:describing, oa:questioning, oa:replying). A subset of the Motivation instances are important to describe feedback to data publishers, and blogs between dataset consumers. 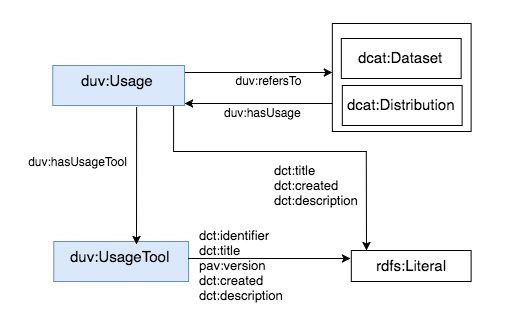 In addition to supporting duv:Feedback, because the Web Annotation vocabulary provides a generic way of annotating any Web resource, it is recommended that Web Annotation vocabulary be used to annotate the dcat:Dataset for uses beyond the scope of the DUV. The Semantic Publishing and Referencing [ SPAR ] Ontologies provides a suite of vocabularies used to related entities to reference citations, bibliographic records, and describe the publication process along with other related activities. The DUV directly relies upon the FRBR-aligned Bibliographic Ontology [ FaBIO ], and Dublin Core [ DC-TERMS ] ontologies are used to describe citations and references between datasets and cited sources. In addition to ontologies the research community provided basic criteria for citing data on the Web [ MSUDataCite ]. These resources helped scope the DUV citation model into the minimal requirements for electronic dataset publication. Finally, data citation principles being adopted [ FORCE11-Citation ] are also being considered to ensure the DUV is consistent with guidelines developed by other data citation communities. As discussed earlier, the intention of the DUV is to be thorough enough to offer a starting point for describing dataset usage and yet be open to using other alternative classes and properties as required by developers. For example, duv:Feedback the subclass of oa:Annotation reuses the object property oa:hasBody. 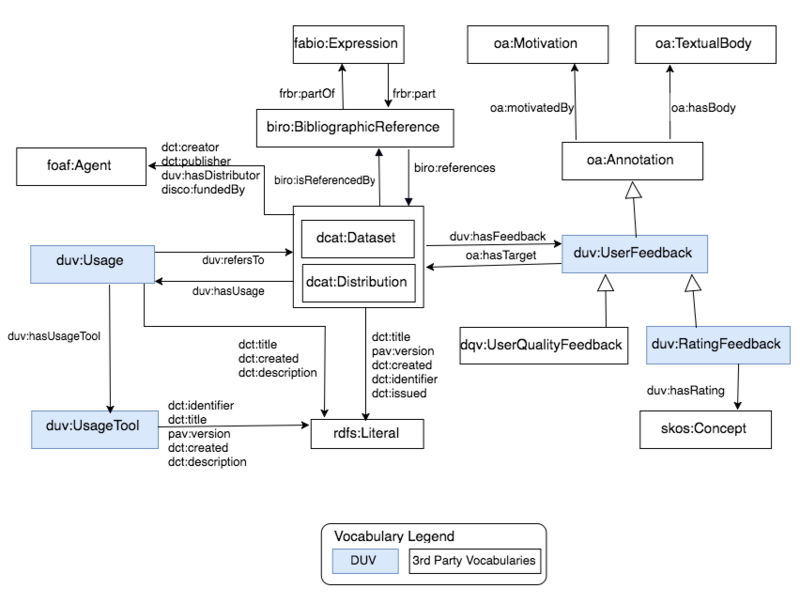 While the [ Annotation-Vocab ] uses oa:TextualBody as a means to capture textual information, however what if needed to capture feedback in alternative ways, it is highly suggested spending time exploring resources such as the Open Knowledge Foundation, Linked Open Vocabularies [ OKFN ] such as using the Review vocabulary [ REV ]. This vocabulary features a very lightweight way to specify ratings. While the focus of this document is mainly on representing the DUV using semantic expressions, a very active effort Schema.org [ SCHEMA ] provides lightweight data structures that can be used as markup that commercial search engines recognize, aiding in discovery. Not only do Schema.org and the DUV rely on many related concepts, efforts are underway to extend the Schema.org to support additional data structures. This section depicts the vocabulary in its entirety as a conceptual model. Boxes are used to identify each class. Labeled open arrows identify object and literal properties. White arrowheads depict class inheritance with the parent class identified by the arrowhead. Please note that while most of the properties are reused from other vocabularies, they are included in the diagram to (1) reduce the learning curve required by DUV implementers that would otherwise be spent constantly referencing to third party vocabularies and (2) provide a starting place to familiarize DUV implementers with the basics needed to get them started. The citation model was motivated by the UCR requirement R-Citable It should be possible to cite data on the Web. The citation model is largely based on classes, properties, and recommended approaches taken from the SPAR Ontologies. Data consumers who cite published dcat:Dataset and dcat:Distribution (See Example 1) by using basic bibliographic reference criteria provided by the data publisher. To do this, DUV extensions are added to the DCAT model in two ways: First because dcat:Dataset or dcat:Distribution are forms of electronic media that can be potentially cited, both use the same citation properties. Secondly, to fill any information gaps, new properties were created or properties from other vocabularies were added. The table below shows how a portion of the DUV properties can be used to form a bibliographic reference. Data publishers wanting to annotate dcat:Dataset/dcat:Distribution with bibliographic references that provide data additional insights to data consumers (See Example 2). Data publishers can also annotate a dataset or distribution with bibliographic references provided by data consumers (See Example 3). For example, a researcher uses a dataset for performing some experiments and then publishes a paper with the experimentation's results. The dataset can be annotated with the bibliographic reference of this paper. 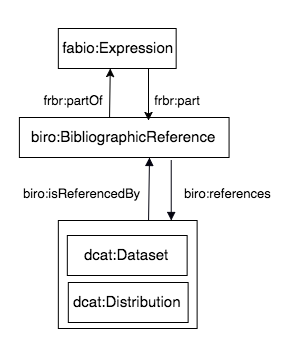 include: dcat:Dataset, dcat:Distribution, biro:BibliographicReference, fabio:Expression. Properties include: frbr:part,frbr:partOf, biro:references, biro:isReferencedBy. Note that while the DUV reuses a limited set of [ SPAR ] classes and properties to support basic [ VOCAB-DCAT ] dataset and distribution citation requirements, the [ SPAR ] ontologies have a richer set of classes and properties for more advanced representations. For example [ FaBIO ] fabio:Expression class has many subclasses (e.g. fabio:Policy) that help characterize referenced material. The following classes constitute the Usage Model: dcat:Dataset, dcat:Distribution, duv:Usage, duv:UsageTool. Properties include: duv:hasUsage, duv:hasUsageTool, duv:refersTo, dct:identifier, dct:title, dct:created, pav:version, dct:issued, and dct:description. The feedback model was motivated by UCR requirement R-UsageFeedback Data consumers should have a way of sharing feedback and rating data (See Example 4) . User feedback is important to address data quality concerns about published dataset. Different users may have different experiences with the same dataset so it is important to capture the context in which data was used and the profile of the user who uses it. R-UsageFeedback should also provide a way for consumers to communicate suggested corrections or advice back to the dataset publisher. 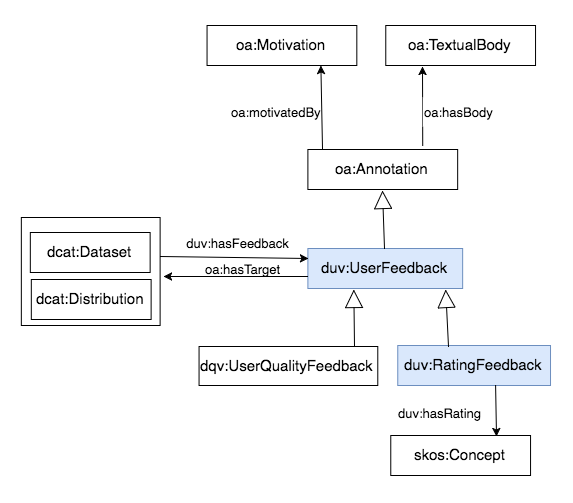 The following classes constitute the Feedback Model: dcat:Dataset, dcat:Distribution, oa:Annotation, oa:Motivation, duv:UserFeedback, dqv:UserQualityFeedback, duv:RatingFeedback, oa:TextualBody. Properties include: duv:hasFeedback, duv:hasRating, oa:hasTarget, oa:hasBody, oa:motivatedBy. Definition Predefined criteria used to express a user opinion about a dataset or distribution using a discrete range of values. Definition Actions that can be performed on a given dataset or distribution. Definition A tool that can use a dataset or distribution. Definition User feedback on a dataset or distribution. Definition An entity primarily responsible for making the resource. Definition The agent (person, organization) responsible for sponsoring the dataset/distribution research that made the creation of the dataset possible, such as codifying and digitizing the data. Definition Body of the comment associated with user feedback. Definition The distributor is the organization that makes the dataset or distribution available for downloading and use. Definition Dataset or distribution associated with UserFeedback. Definition Dataset or distribution usage guidance/instructions. Definition A usage tool (application, service) referred to by usage guidance/instructions. Definition The identifier of the dataset or distribution. Definition The relation between a publication and the bibliographic record or bibliographic reference describing it. Definition Usage performed by agent. Definition An entity responsible for making the resource available. Definition The relation between a bibliographic record or a bibliographic reference and the publication being referenced. Definition Dataset/distribution associated with Usage. This section shows some examples to illustrate the application of the Dataset Usage Vocabulary. The following examples are based on the running example of the Data on the Web Best Practices document. Example 1 - Citation: Basic reference criteria for a dataset. Example 2 - Citation: A memorandum that gives more insights about the dataset stops-2015-05-05. Example 3 - Citation: A research paper that has a reference to the dataset stops-2015-05-05. Example 4 - Feedback: Providing a mechanism for consumers to comment and ask the dataset publisher questions. Example 5 - Feedback: A rating feedback provided by a dataset consumer. To describe possible values for rating, the data publisher used SKOS . "prefLabel" : "A set of values to rate datasets and distributions." Example 6 - Dataset Usage: A dataset consumer uses the distribution stops-2015-05-05.csv to produce a visualization of bus routes from MyCity. A route calculator service was used to generate the bus routes (http://example.org/route-calculator). The dataset publisher collects this usage and updates the dataset metadata with a new property duv:hasUsage .